Spring cleaning. It is time to get really down and dirty with cleaning and organizing your home. Naturally, we think of cleaning out our closets, wiping down baseboards, walls, but often, we forget about our makeup. Vanity, makeup bags and kits need love too. Especially because of bacteria that can harbor in cosmetic/makeup as they too have expiration dates. I have a previous post all about when to toss makeup. Taking a cloth and wiping vanities down with alcohol or maybe water and vinegar depending on the finish of your vanity. Definitely go through your makeup bag and toss anything that doesn’t smell or look fresh anymore. 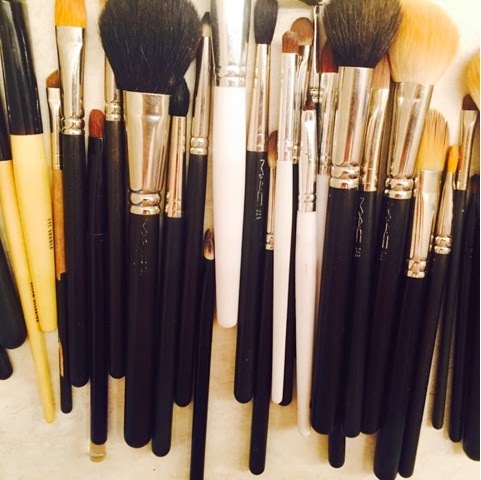 Makeup kits should be wiped down and organized as it should always be clean and presentable. Wiping down foundation, moisturizer lids. Sanitizing lipsticks . Toss leaky glosses, replace sharpeners, lash curlers should be replaced too. Another product we often forget about are sponges. They harbor a lot of bacteria and should be replaced frequently. I always say with initial application apply with a brush then touch up with a sponge. And, always cleaning your brushes. The safest tip I can give you is to invest in a brush cleaner. They are designed for brushes! They clean and sanitize them in a safe way. What are some of your makeup cleaning tips? Happy cleaning ladies and gents!